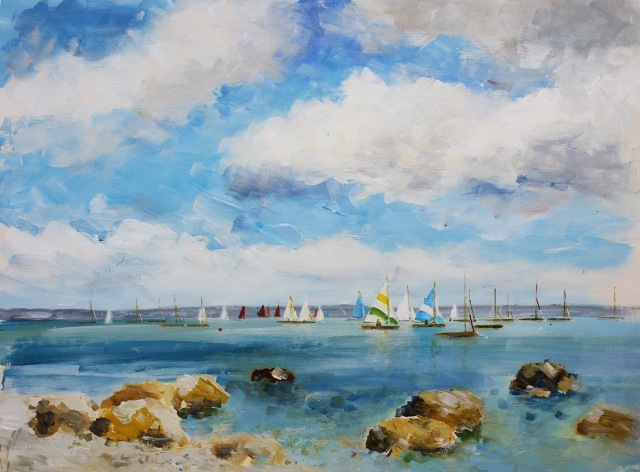 Workshop details are complete for The Bembridge Sailing club and The George Hotel 2018-2019 season, see details further down the page! PLEASE CONTACT ME / LEAVE ME YOUR DETAILS FOR FUTURE WORKSHOPS OR TO ENQUIRE FOR SPACES ON MY TUES/WED CLASSES. NO EXPERIENCE NECESSARY! I have been teaching since 1994 both privately and for the Adult Education Service at the Isle of Wight College. 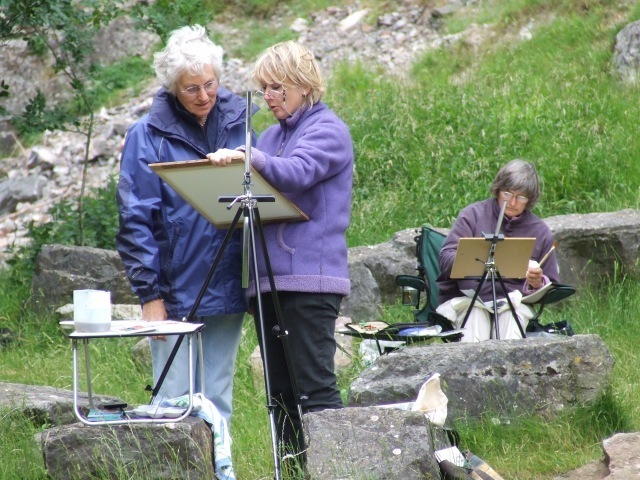 Over a number of years I have run outdoor summer classes, workshops and tuition and I also enjoy demonstrating to groups. 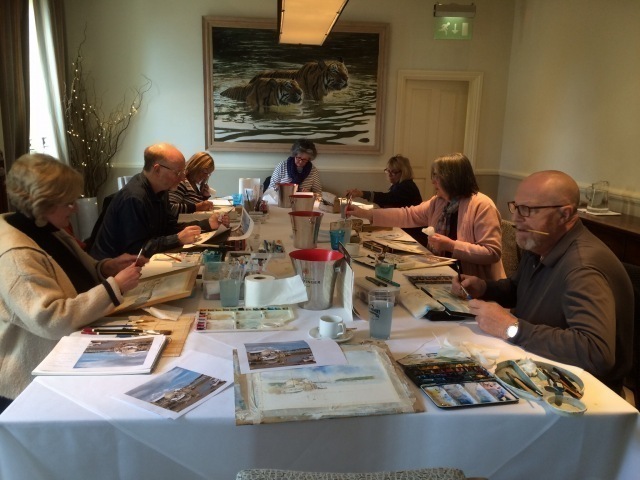 My tuition is always geared to the individual, whether within a group setting or on an individual basis and I really enjoys seeing people develop their painting skills and their enjoyment gained from this. "Being a participant in one of Becky's art courses is a relaxed, enjoyable but challenging experience. She manages to provide a thoughtful balance between practical demonstrations of technique at the right time with individual and personalised support to help members of the group develop their confidence and improve their skill levels. I ended the day enthused and feeling that I wanted to get to work and develop my own ideas. A genuinely satisfying happening. Thanks Becky." ''I have just spent a wonderful day of painting with Becky Samuelson. Having not painted for a while I had lost much needed confidence which was instantly restored with the expert help from Becky. I learnt many new brush stokes and techniques during the day working with both acrylic and oils and came away very happy with my creations. I would not hesitate to recommend Becky more highly''. ''Even on grey days, Becky put the colour into my painting. 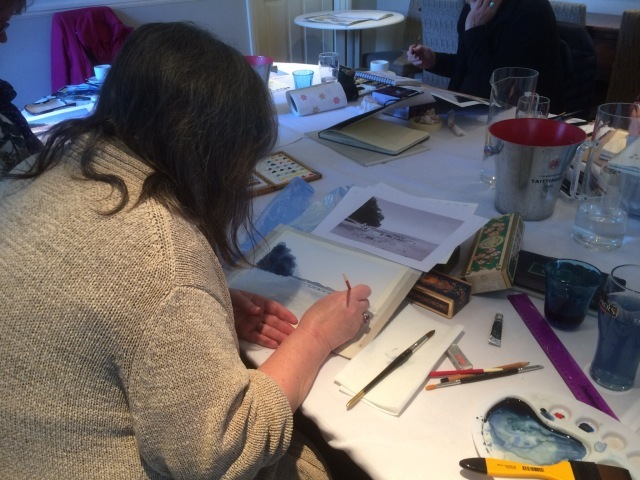 She is an enthusiastic and inspiring teacher and spending the day on one of her courses with a group of like minded painters boosted my confidence and improved my skills tremendously''. Please contact me if you are visiting the Isle of Wight and would like some tuition. We have some great B&B's, hotels and guest houses on the Isle of Wight. In this workshop we will look at a couple of smaller studies to practice as much as possible. One will look at a subject with some action on the water and another that reflects the sea with the water lapping around rocks and pebbles. 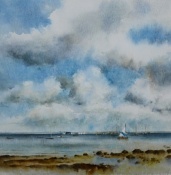 The day will include the techniques of painting skies and water, wet in wet and colour mixing and the workshop will be suitable for beginners as well as those more experienced. £75.00 per person to include tea and coffee, 2 course lunch and tuition. The day runs from 10.00am until 4.00pm Please arrive promptly for a 10.00am start. Booking is through the George hotel direct Rachel smith mailto:info@thegeorge.co.uk or telephone 01983 760331 and full payment is required at point of booking. Refunds will only be issued if place re-sold. Please contact Becky on 01983 873351 or becky@beckysamuelsonfinearts.co.uk for any queries on materials. A wonderful method of painting which allows the painter to either sketch or complete a fuller painting. The pen is a lively and spontaneous method of working and gives great satisfaction with the results. 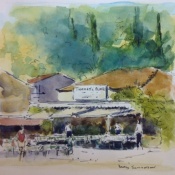 Becky will guide you firstly through the techniques of using pen and wash plus the watercolour techniques you need to achieve this and the workshop will be suitable for beginners as well as those more experienced. Please bring a waterproof pen such as an 'edding pen' plus your usual watercolour equipment; further details on request. This is an lovely beach on the south side of our island and the subject includes the land that meets the sea plus the introduction to some buildings. 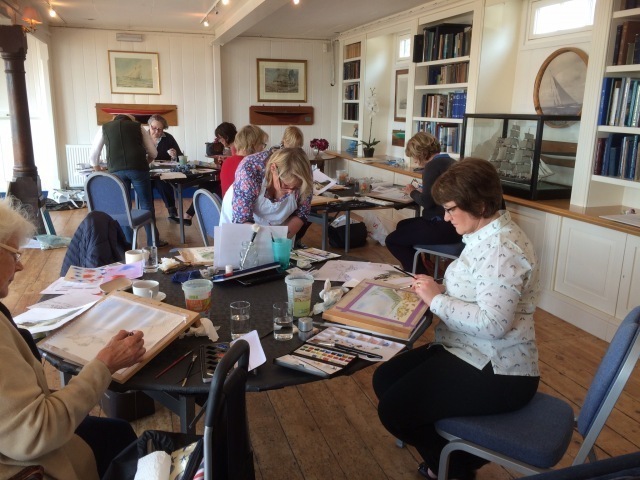 In this workshop we will learn about composing such a subject and simplifying the various aspects to produce a watercolour full of character. The workshop will be suitable for beginners as well as those more experienced. Please bring your usual watercolour equipment; further details on request. £75.00 per person, to include refreshments and a two course lunch and tuition. The day runs from 10.00am to 4.00pm Please arrive promptly for a 10.00am start. Full payment is required at point of booking. Refunds will only be issued if place re-sold. 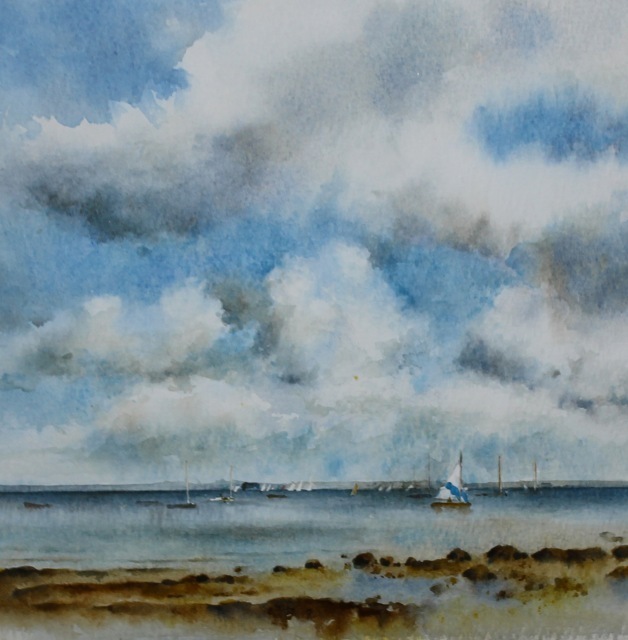 In this workshop we will look at the colours needed and techniques required for painting sunsets in watercolour. I aim to do smaller paintings so that there we may have the opportunity of doing more than one piece. 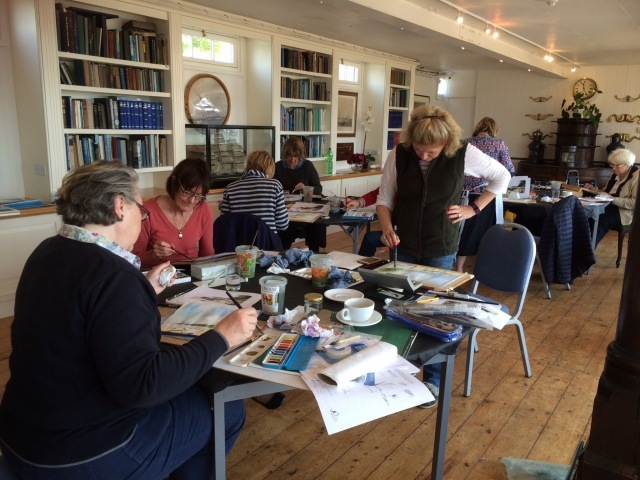 The workshop will be suitable for beginners as well as those more experienced. Art day payments need to be made when booking your place. 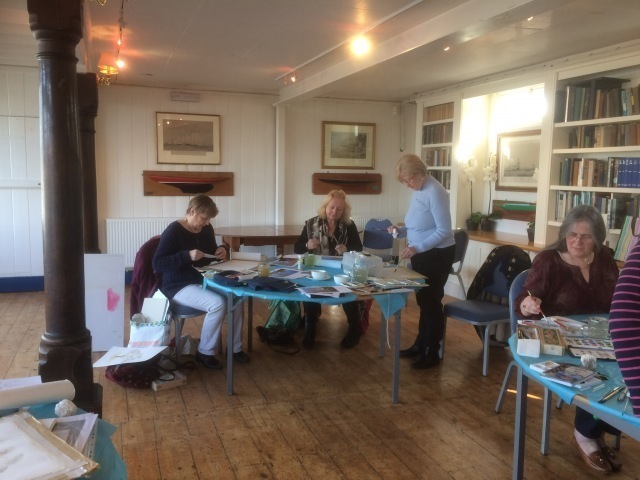 We welcome you to the art workshops at the Bembridge Sailing club. Each can be booked individually or you can pick as many as you like! Each workshop is suitable for all, whether you are a complete beginner, an improver or perhaps just wanting to increase your confidence. I want these workshops to be informative but fun. 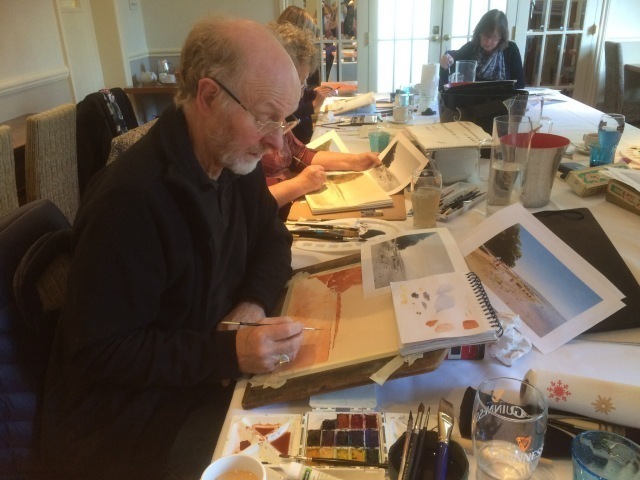 Although each workshop has a theme, I will include aspects that are common to all subjects whether it be the main techniques required, composition and drawing techniques, colour mixing, perspective or tone. Please do contact me with any concerns or queries. Please bring your own watercolour materials; an equipment list can be supplied… but please bring more than one sheet of watercolour paper! 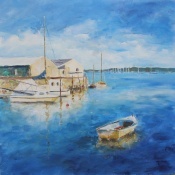 We will be painting Summer views of Bembridge harbour. 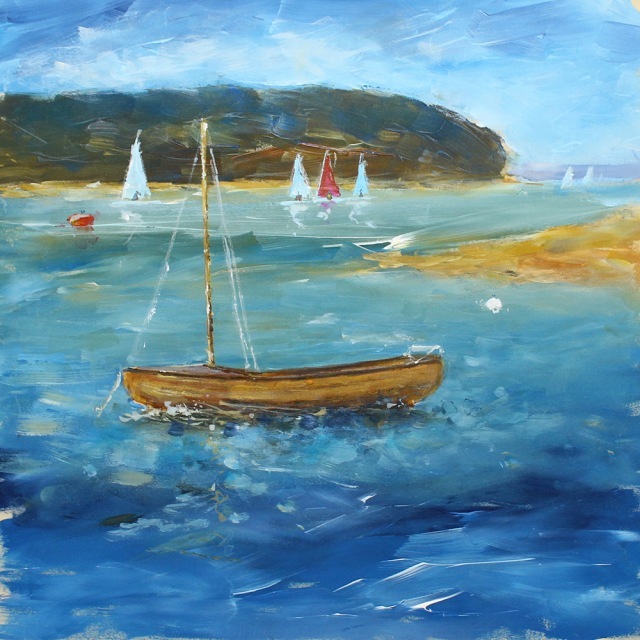 I would like us to capture boats bobbing on the water, keeping those summer memories alive… and the day will include looking at the techniques for painting simple skies, water and a couple of boats! It will be suitable for all and the aim is to do several smaller pieces to get lots of practice in. £72.00 per person, to include refreshments and a two course lunch and tuition. The day runs from 10.00am to 4.00pm Please arrive from 9.30 for a 10.00am start. We see reflections in many subjects whether it is the sky in water or reflections from a buoy or a boat. 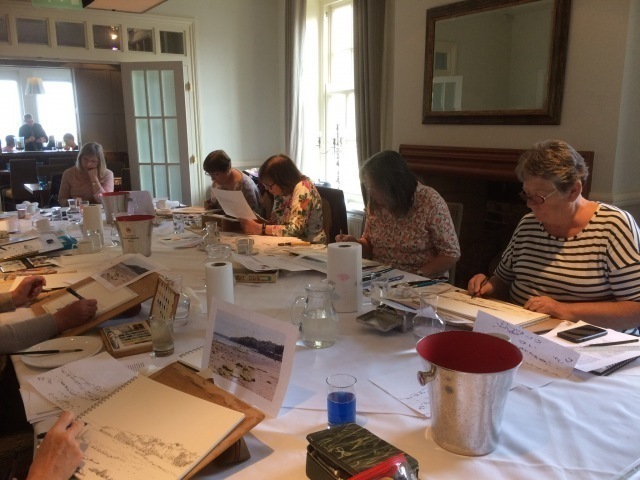 In this workshop we will look at the different techniques needed to paint reflections and will concentrate on a couple of smaller paintings so we can explore this as fully as possible. This is a lovely subject to paint and we can clearly see the beauty of trees in the winter months. I want to look at how we describe the structure of trees and branches, the colours and techniques needed in order to create a sense of shape and character. Please bring your own painting materials. Further details on request. A wonderful method of painting which allows the painter to either sketch or complete a fuller painting. The pen is a lively and spontaneous method of working and gives great satisfaction with the results. Becky will guide you firstly through the techniques of using pen and wash plus the watercolour techniques you need to achieve this. I aim to do several studies during the day so we can practice as many subjects as possible. The workshop will be suitable for beginners as well as those more experienced. 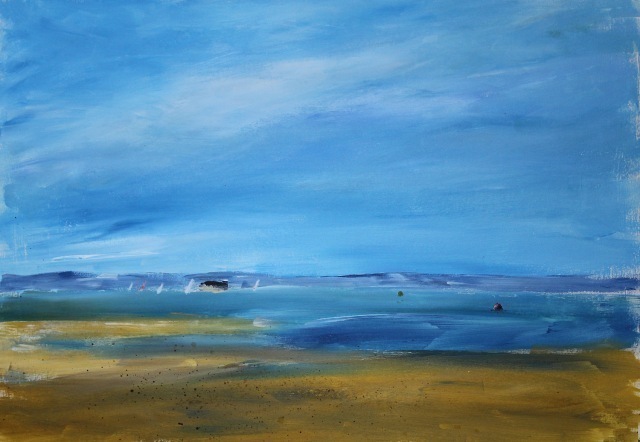 In this workshop will explore painting a landscape view from one of the downs. It will incorporate the sky, the distance plus some foreground interest. Lots of practice at wet in wet and wet on dry! Please can you bring some masking fluid with you. 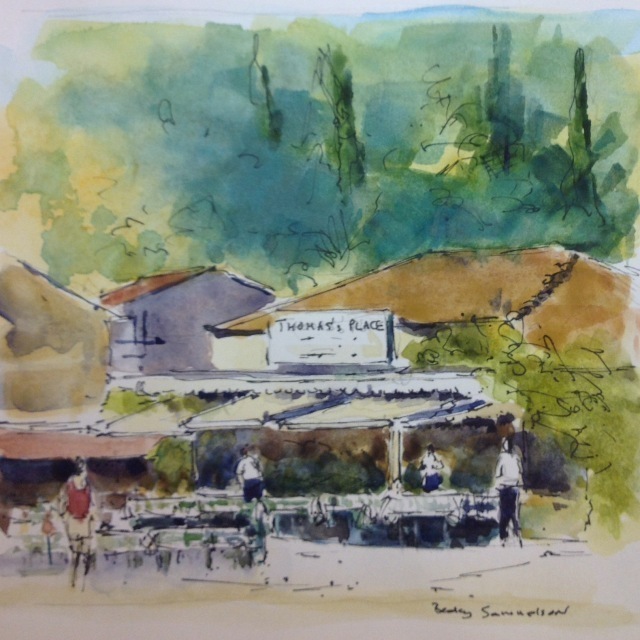 I would like us to paint from the beach in front of the club, to practice sketching techniques. If the weather is poor we can still paint from the club house or balcony. The video lessons for Arttutor .com are now live!! Do have a look at their membership plan; they offer great all round tuition. Painting a simple sky/seascape including the principles and techniques of acrylic painting. Painting a simple boat on the sea. 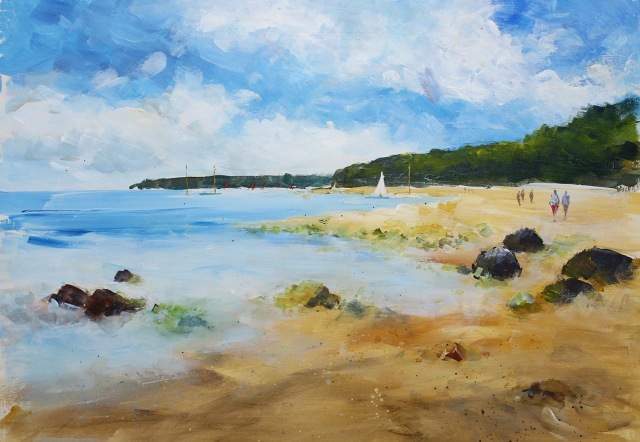 Painting a simple beach scene including sky, trees, beach, sea and rocks. Painting a more complicated seascape, increasing the skill level. Painting a complex view of a harbour; advanced skill level.